PCO tanks are portable polyethylene tanks classified as multi-purpose tanks. Plastic PCO tanks are known as pest control operator tanks and as sprayer, pressure washer, and utility tanks. Regularly used in containing water and chemicals, including fertilizers and pesticides. Applications can be stationary or transportable (non-DOT approved). Principal uses include agriculture, nursery, lawn care, pressure-washing systems, and industrial uses. Tanks are available in 30 gallon to 300 gallon capacities, in 1.5 and 1.7 specific gravity ratings. These poly tanks are produced with virgin polyethylene according to FDA regulation 21 CFR 177.1520 (1) 3.1 and 3.2 requirements for potable water storage. The tanks are manufactured with UV inhibitors to extend tank life against sun exposure, making them suitable for inside/outside applications. Poly PCO tanks are of seamless design to provide durability and resistance to damage. Rounded bottoms provide ideal fluid drainage. Internal baffles for support and fluid control, as well as 2” deep sump options are available. PCO tanks are semi-transparent and have gallon indicators. In transportation, tanks must be secured and galvanized steel bands are offered for this purpose. PCO tanks are available with flat spots molded into both ends to serve as mounting areas for fittings or for agitation equipment. 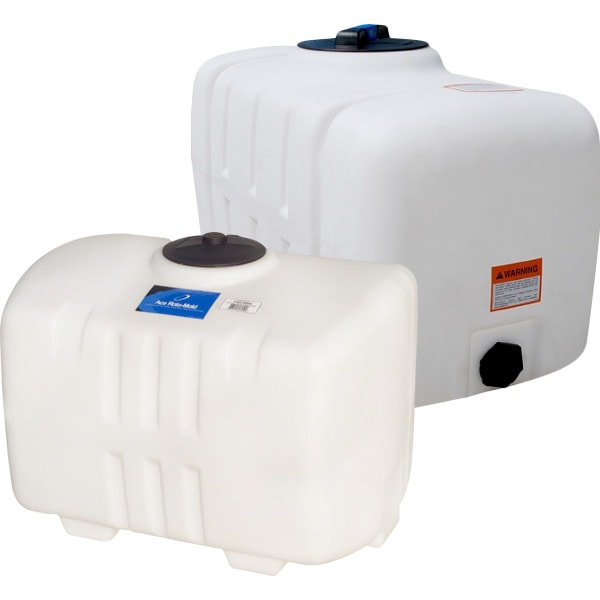 All Protank’s polyethylene PCO tanks have 3 year manufacturer warranties. Contact Protank concerning Polyethylene PCO tanks, customization options, or for more information.